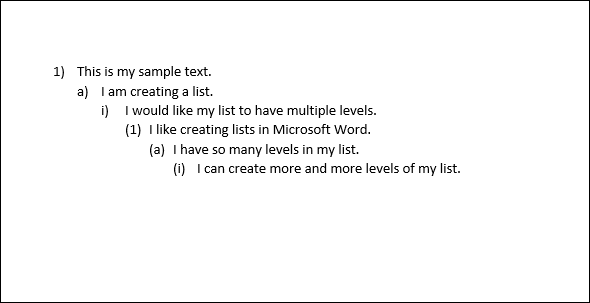 Microsoft Word lets you easily create and format multilevel lists in your documents. You can choose from a variety of formatting options, including bulleted, numbered, or alphabetized lists. Let’s take a look. 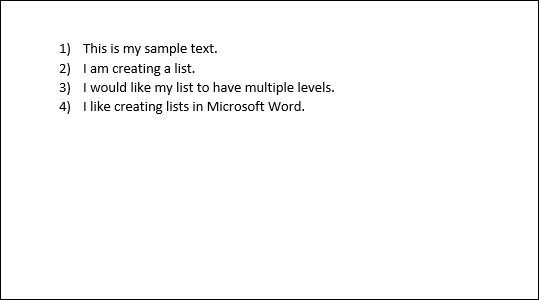 Creating a multilevel list in Word is dead simple. Start by typing out one or more lines of your list, with each item of your list on a different line. Then, select those lines. 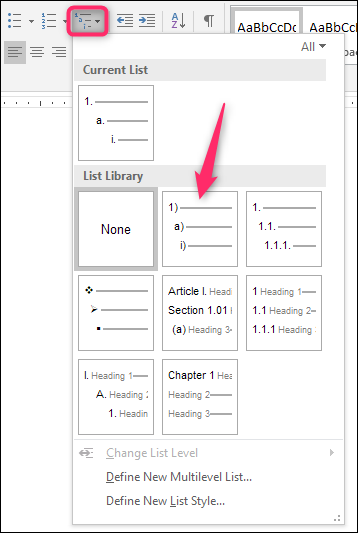 On the “Home” tab of the Ribbon, click the “Multilevel Lists” button, and then click one of the built-in lists types shown on the dropdown menu. Your list will now be formatted in the style you chose. And yes, right now, it’s a single-level list. 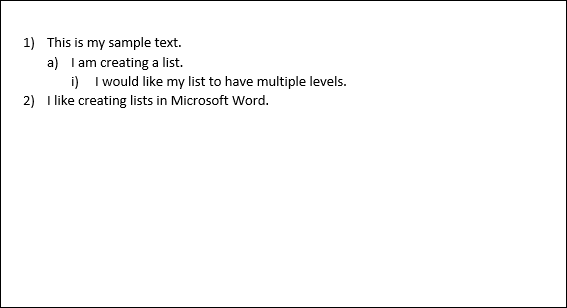 The truth is that technically, single- and multi-level lists are not much different in Word. It’s not until you start promoting and demoting list items that it turns into a multilevel list. 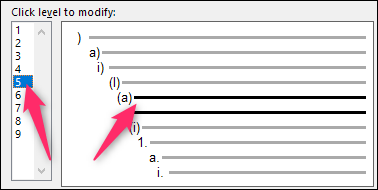 Demoting a line in your list indents the line and bumps it to a lower list level. Promoting a line does just the opposite. Start by placing your cursor at the beginning of the line you want to demote or promote. To demote that line to a lower list level, just hit your Tab key. You can also demote a line more than once by just pressing Tab however many times you need. Here, we’ve demoted the third line in our list twice. Repeat these steps if you would like to add four, five, or even more levels to your multilevel list. and then hitting the Tab or Shift+Tab keys. While just using the Tab and Shift+Tab key combos is probably the easiest way to promote or demote lines on your list, Word does have a menu option for choosing a specific level. Place your cursor anywhere in the line you want to change (or select multiple lines if you want to change more than one). 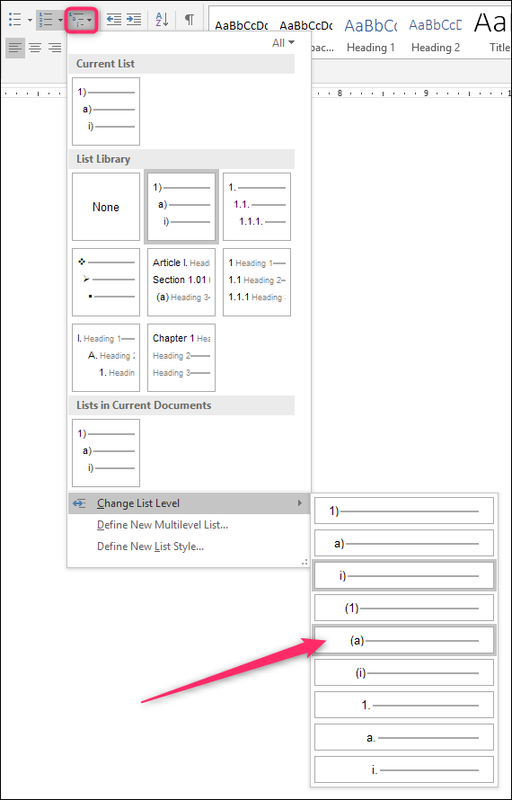 Click the “Multilevel List” button on the Home tab of the Ribbon, point to the “Change List Level” option on the dropdown, and then select the level you want. And the line (or lines) you selected get changed to that level. Sometimes, you may decide that you want to change the basic type of multilevel list you’re using. Perhaps you originally went with numbers, but now want to use bullet points. Or maybe you just want a different numbering scheme. Whatever the case, you can easily make that change. Place your cursor anywhere on any line of your list. It really doesn’t matter where, because this is going to change the whole list. 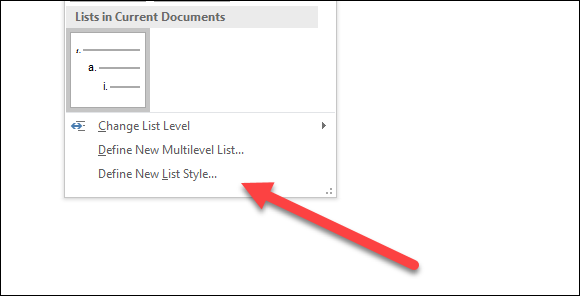 Open that “Multilevel Lists” dropdown menu again, and this time, just click any of the other default list types on the menu. Your whole list changes to that new type. So, what if you want to change something about your list like the way just one line level is numbered or how the levels are aligned. Well, you can do that, too. 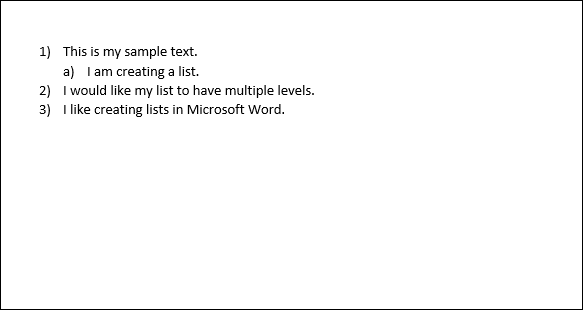 Multilevel lists in Word are pretty customizable, letting you make changes to just about every aspect. Start by placing your cursor anywhere on any line of your list. Open the “Multilevel List” dropdown, and then choose the “Define New Multilevel List” command. 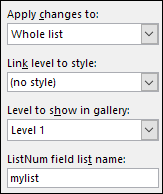 The Define New Multilevel List window pops up, showing you a number of basic options for customizing how the lines in your list appear. However, there’s more here than meets the eye, so go ahead and click that “More” button down in the bottom left corner. Now, your window should look like this, with a bunch of extra options off to the right. So, here’s the rundown. First, select the level of the list that you want to modify. You can click either in the simple numbered list to the left, or on a line in the center window that shows how the list actually looks. Below that, you’ll find a bunch of options for changing the number format and positioning for the selected level appears. 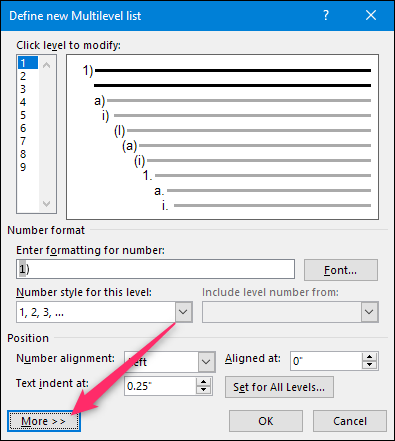 Enter formatting for number: You can type the text for the line number as you want it to appear in this box. Click the “Font” button to its right to change the font used for the level. 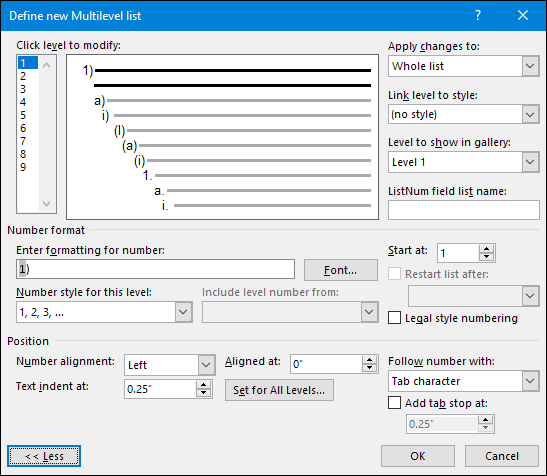 Number style for this level: Use this dropdown to change the style of the selected number level. You can change it to pretty much any number or bullet style you want. You can even mix bullet points into a numbered list this way (or vice versa). Include level number from: Use this dropdown to include the number from a previous level. This lets you create line numbers like 1.1; 1.1.1; and so on. Start at: Choose the number or letter where you want to start the numbering. Restart list after: Have the list restart after it reaches a certain number or letter. Position: Use the controls in the “Position” section to change how the selected number level is aligned and indented. You can also click the “Set For All Levels” button to control alignment and indents for your whole list. You can also choose whether the line number is followed by a tab character (the default), a space, or no character at all. Apply changes to: Choose whether you want to apply changes to the whole list, from the point where your cursor is placed in the list, or only levels you’ve selected. 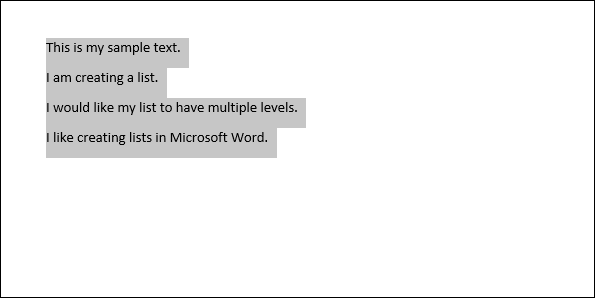 Link level to style: You can use this dropdown to link your selected level to a style, whether a built-in Word style or one you’ve created. This can be particularly handy for linking levels to heading styles. 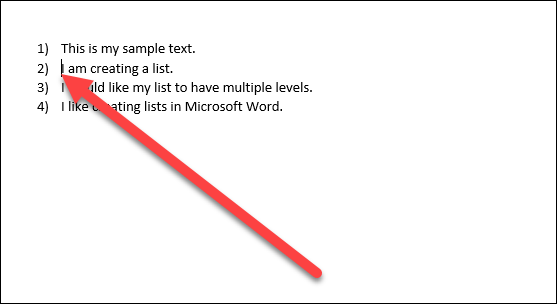 Level to show in gallery: This dropdown lets you choose the level of the list that’s shown in the gallery on Word’s Home tab. Honestly, its not a very useful option, and it’s usually best to leave it set to its default—Level 1. ListNum field list name: Use this field to associate the level with a name that you can then use along with Word’s LISTNUM function. This is useful if you’re creating functions to generate lists. After making changes to a particular level, you’ll need to repeat the process for each additional level of the list you want to modify. So, select a level, make your changes, select the next level, make those changes, and so on. When you have finished changing all the levels you want, click the “OK” button, and your multilevel list will now show your changes. 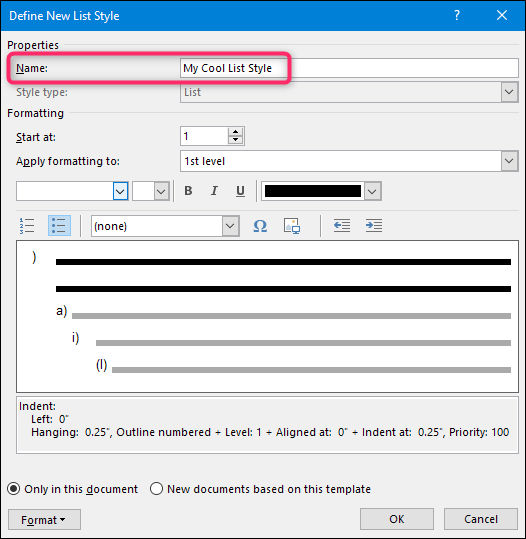 After customizing you multilevel list just the way you want it, you may find yourself wanting to use that same formatting for other lists—even lists in other documents. You can do this by turning the list into a style. 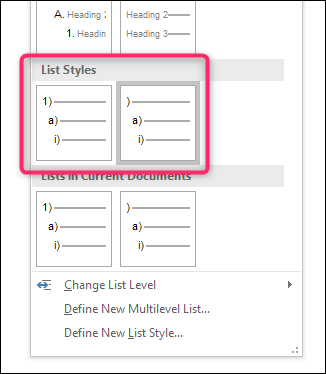 Place your cursor anywhere on any line of your list, open the “Multilevel List” dropdown menu again, and this time, choose the “Define New List Style” option. In the Define New List Style window, start by giving your new style a name. Now, there are a number of formatting options available in this window. You can change the font, character formatting, type (number or bullet), and several other things that you were also able to change when customizing your list. While these options can be useful if you want to create a quick new multilist style from scratch (i.e., when you have not already created and customized a list you want to turn into a style), we highly recommend that you don’t bother with them. 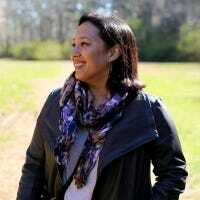 Instead, it’s much more effective to create your list, customize using the more powerful tools we talked about in the previous section, and then creating your style. The new style will include all those customizations you’ve already made to the list. 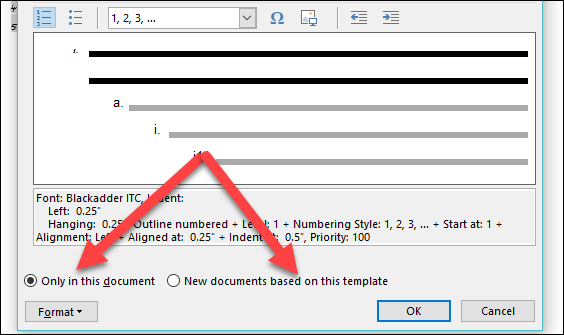 One option you will want to pay attention to is whether you want the style to be available only in the current document, or in new documents based on the template attached to the document. You’ll want to choose the latter if you need to access the style when you create other documents. Choose what you want, and then click “OK” to save your new style. 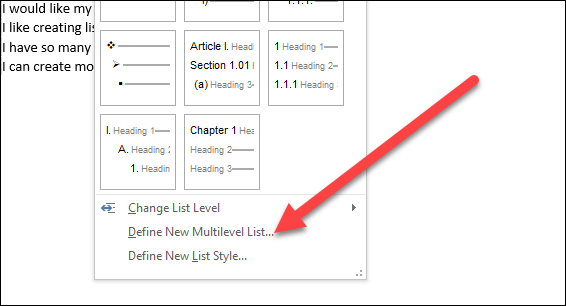 Now, you’ll be able to choose that style (or any other list styles you’ve created) from the “Multilevel List” dropdown menu any time you want to create another multilevel list. 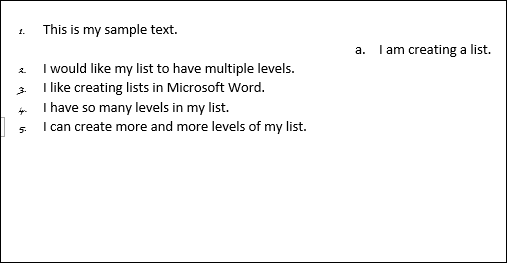 And now you know more than you ever wanted to know about creating multilevel lists in Word.